Discover strategies to effectively manage a loved one’s care, stay in control and reduce financial burdens on the family during a medical crisis. Solid legal and financial planning is your answer and can help you put an end to all of the confusion and overwhelming feelings that you currently face. How to use legal planning to get your loved one eligible for MEDICAID benefits instead, which covers costs that Medicare does not — even if your loved one initially has too much income or too many assets to qualify. 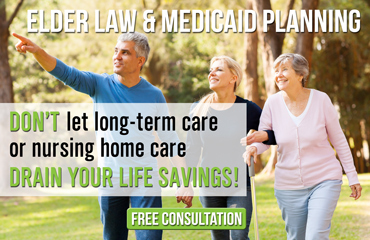 BONUS FREE MEDICAID PLANNING CONSULTATION CERTIFICATE! At the end of the Caregiver Guide, you will receive a certificate to meet with an attorney at the The Elder Law Firm PC, at no-charge, to have all of your remaining questions answered and help you begin the process of creating a solid legal plan for your loved one’s protection and your peace of mind.